Israeli forces killed 55 Palestinians on the Gaza border in the conflict’s bloodiest day in years on Monday as clashes and protests coincided with the deeply controversial opening of the US embassy in Jerusalem. The surge in fatalities led South Africa to recall its ambassador in Israel “with immediate effect until further notice” while condemning the deaths “ in the strongest terms possible”. 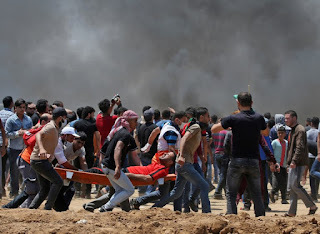 The clashes, which left more than 2,400 Palestinians wounded, erupted before a White House delegation and Israeli officials opened the embassy at an inauguration ceremony in Jerusalem and continued throughout the day. The dead included eight children under the age of 16 , according to the Palestinian envoy to the United Nations. The Gazan health ministry provided the overall death and injury toll. Tens of thousands had gathered near the border in protest while smaller numbers of stone- throwing Palestinians approached the fence and sought to break through, with Israeli snipers positioned on the other side. The embassy inauguration nonetheless went on as planned , attended by a Washington delegation that included US President Donald Trump’s daughter Ivanka and her husband Jared Kushner, both White House aides. Ivanka Trump helped declare the new embassy open and a plaque and seal were unveiled before the 800 guests at the ceremony. “Our greatest hope is for peace ,” he said despite the Palestinian anger the move has provoked.